Suppose you have an unknown clear substance immersed in water, and you wish to identify it by finding its index of refraction. You arrange to have a beam of light enter it at an angle of $45.0^\circ$, and you observe the angle of refraction to be $40.3^\circ$. What is the index of refraction of the substance and its likely identity? This is College Physics Answers with Shaun Dychko. An unknown material is submerged in water and we have a beam of light with an angle of incidence 45 degrees. So, theta one is 45. And, we can also measure the angle of refraction here, which is 40.3 degrees. And, we know that since this material is immersed in water, the initial index of refraction is 1.33. And, Snell's law says that index of refraction of the first material times sine theta one equals index of refraction of the second material, which we don't know, multiplied by sine theta two, which we do know. So, we'll solve this for N two by dividing both sides by sine theta two. So, N two is N one sine theta one over sine theta two. 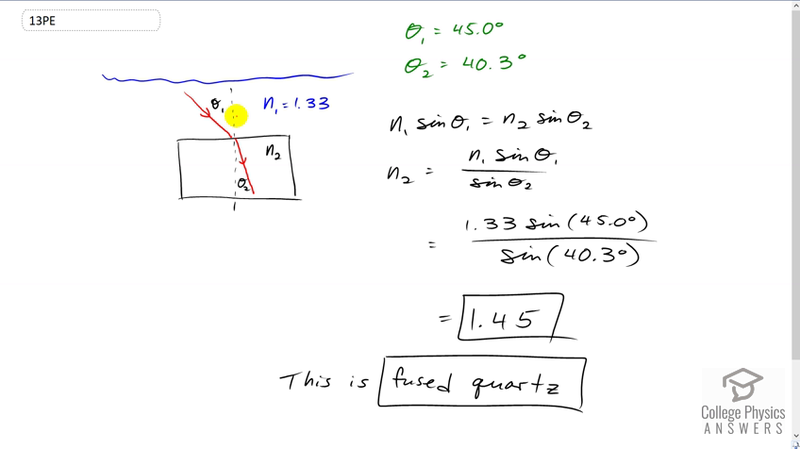 So, that's 1.33 index of refraction of water times sine of 45 degrees incidence angle divided by sine of 40.3 degrees angle of refraction, giving us 1.45. And, looking in table 25.1, this appears to be fused quartz.